Travel-NEPAL.com, The Ultimate Site On NEPAL - Samayak. The Samayak (Dana) a Sanskrit term, means "Correct (Charity)" The solemn ceremony of regular Samayak, take's place once in twelve years in the Swoyambhu Hill in Kathmandu. It is the most momentous and grandest of Kathmandu city's Buddhist religious performances. An optional Samayak ceremony can also be performed by private individual donors, but its undertaking is so highly expensive that it has not been performed in Kathmandu was by a wealthy merchant name Samayak Ratna Tuladhar of Nhyakha. The celebration of Samayak ceremony draws all high caste Newar Buddhists together to participate in free-feasting and gifts-offering to Gubhajus and Beares (Newar Buddhist priests and monk-gurus) functions for the worship of major Buddhist deities. The celebration of Samayak also reflects the relationship that is happily existing between the monarch and the Buddhist community. 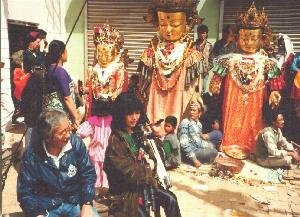 During Samayak celebrations, images of Buddha from the farthest corners of Kathmandu Valley are brought to the royal palace at Hanuman Dhoka. The royal family gives patronage and participates in the mass donation in celebration of the Samayak ceremony. The celebration of Samayak involves feeding boiled rice, pulse gruel, radish curry, sweets etc. and offering different kinds of soft drink and gifts to the Bares. Boiled rice, pulse gruel, sweets etc. served at the feast are prepared by Urayas and radish curry, by Ares from Itumbahal. If the optional Samayak ceremony is performed by a person of another caste other than Gubhaju, Bare and Uraya, boiled rice is not customarily served at the feast. As for example, when such a ceremony was performed in the time of Junga Bahadur Rana by Dharma Narayan Manandhar, only parched rice and not boiled rice was offered. Similarly in 1948, when it was performed by a Ranjitkar of Mazipat, only GULMARI, a confectionery item made from rice flour, was offered in place of boiled rice. Only Gubhajus, Bares and Urayas have the right and obligation to be involved in the operation system and management processes of the Samayak celebrations. There is evidence to support the view that the celebration of Amyak was first started in the 15th century by Golchandra of Itumbahal. The "Samayak Celebrations Trust" was gradually established over time and plots of land were placed under its trusteeship to ensure sustainability in the celebration of Samayak once in three years performed on a regular basis for several reasons and it virtually stood on the point of being discontinued. Historical records illuminate that king Prithivi Narayan Shah the Great ensured the celebration of Samayak on a regular and continuing basis once in twelve years by institutionally consolidating and management and resources of the "Samayak Celebration Trust". It is true that had it not been for this reason, the performance of regular Samayak could not have been maintained till the present. Huge bronze statues of Buddha constitute the spectacular feature of the Samayak celebration. There are two types of Buddha image. There are those from each of the main monasteries that are meant to represent the main deity of the monastery. Normally it is the Shakyamuni Buddha. Secondly, there are images of Dipankara Buddha belonging to particular families that have been created by individuals who have performed optional Samayak (Dana) ceremonies. 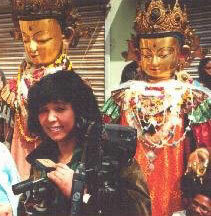 These Dipankara Buddhas are individual donors of optional Samayak (Dana) ceremony themselves. One of the ideas behind Mahayani Buddhist ritual is the identification of the worshipper with the deity. On the eve of Samayak celebration, huge bronze statues of Dipankar Buddha and other Buddhist divinities are brought to the royal palace at Hanuman Dhoka where they receive worship and alms from the royal family and the general public. Next day, they after the arrival of His Majesty the King that the Samayak celebration commences. Seated in a special pavilion built on this occasion, His Majesty the King observes while the assembled deities, Gubhajus and Bares receive mass offering. Dipankara Buddha has come to be associated with the virtues of Buddhist alms giving. The principal scripture related to Dipankara Buddha is the Kapisarvananda. It stresses the importance of feeding and giving alms to the monastic community.Buddhist monks cannot claim anything from the laymen yet it is considered as the laymen's duty and privilege to provide monks with food, clothes, lodging and whatever else they might legitimately need. It is the most obvious and easy method for laymen to acquire religious merit. The monk by leading a good life to the best of his ability ensures that the gifts provided by the piety of laymen and laywomen earn for them the fruitiest reward. It is a meritorious thing to maintain and provide comforts to those who have renounced the world. The Buddhist scripture of Kapisarvananda begins with the story of a boy named Dharmashree who has nothing to offer to Dipankara Buddha but a pile of dust he has been playing with. Because he offers it with such a pure mind, it turns into gold. 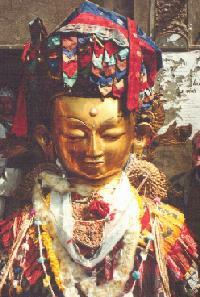 Dipankara Buddha predicts that he be reborn in the royal family in the city of Dipawati. The King of Dipawati (Shakyamuni Buddha in his previous life), Sarvananda gave alms of meal to Dipankara Buddha and his disciples. As a result he could attain Buddhahood and become popularly known as Shakyamuni Buddha in his next life. Symbolic of this is the performance of Samayak (Dana) ceremony. The implication of this celebration is that an ordinary devotee of today can also, by giving alms of meal to the monastic community, set out on the path to enlightenment as the Buddha. It is tempting to assume that the age-old Samayak celebration of Kathmandu has grown out of the prevalent Buddhist practice of giving alms of meal to the monastic community. 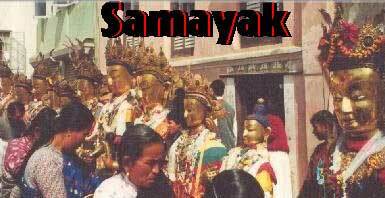 The regular Samayak celebration that takes place once in every twelve years is scheduled to be held on the first day of the month of Magh (January 14, 1993) this year in accordance with the glorious time honored Mahayani Buddhist tradition.